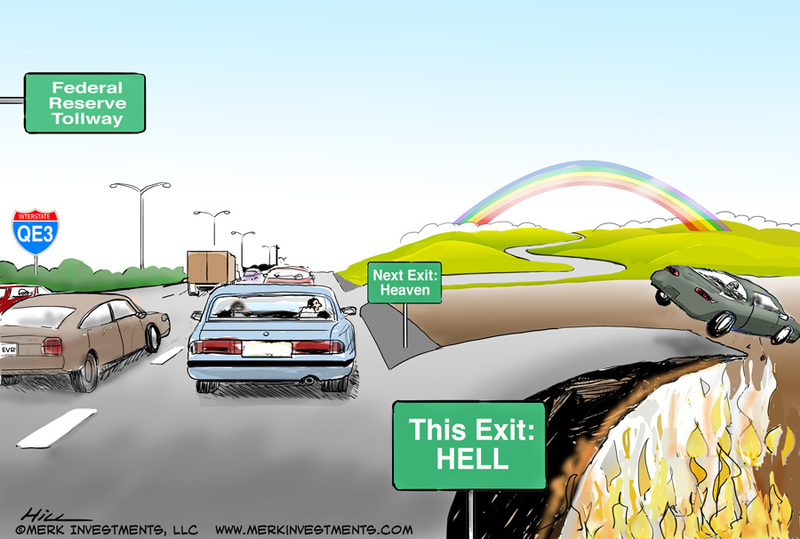 Merk Insights - What's Your Exit? Are you prepared for an “exit”? If the Fed pursues an “exit” from ultra low interest rate policy, are you prepared for an exit from the stock market should things turn South? We discuss how investors prepare, noting the most common mistakes investors make along the way. Are you prepared for an exit? No, you are not. We know because we meet investment advisers that have dropped their defensive strategies because they were losing clients. Those we meet that say they are prepared think they can get out at the right time should the markets topple over as the Fed exits; our guess is pigs will learn to fly before many will get that timing right. And those who don’t rely on luck are the first to tell us they don’t think they are fully prepared, as it’s rather difficult to predict how things will unfold. Should you prepare for an exit? There’s a group of investors that say an “exit” is ludicrous – there’s no way the Fed will pull off an exit. It turns out we sympathize with that view, but think getting ready for a Fed exit is still paramount. As I wrote in my book Sustainable Wealth, a prudent investor plans for different scenarios. Any scenario that has a non-negligible probability with a potentially profound impact on one’s portfolio should be taken into account. We don’t really have to go much further than this, as all we have to do is look at today’s market: in today’s markets, risk premia are highly compressed. This may sound academic, but what it means is that investors downplay the risk embedded in risky assets. We can see that through investors bidding up junk bonds and buying debt of weaker Eurozone countries. We can also see it in the stock market, where volatility is lower than what has historically been considered normal (i.e. the VIX index is at an unusually low level). In plain English, this means markets may be priced to perfection. And that’s where the problem is: the world isn’t perfect. As such, just the hint of a Fed exit might cause havoc in the market, even if it is never actually pursued. Please read ‘Instability the New Normal’ for an in-depth analysis on how this may unfold. •	Feeling like you’re losing out because you’re not keeping up with the stock market. No: you should develop a financial plan tailored towards your circumstances. You should not care how much the guy or gal next to you, or the “market” makes. •	Feeling like you haven’t saved enough for retirement and as a result should invest in the stock market to make up the shortfall. No: Warren Buffett got to the point when he said: "The stock market has a very efficient way of transferring wealth from the impatient to the patient." The prudent investor waits to find good values; the impatient investor is bound to invest at the top by chasing trends. •	Feeling like you can’t invest more because you don’t make enough money. For most, spending, not income is the problem. Remember the days back in college when you could live off very little? Spending $80 a month on a phone bill is a luxury, not a necessity. •	Not spending any time researching investment options. Many spend more time researching which HDTV to buy than researching an investment. Just because you can buy the world with a push of a button, doesn’t mean you should. You worked hard to earn those savings; now spend a little time researching what to do with your savings. •	Not understanding true diversification. Diversification is not about labels, but correlation. When policy makers are very engaged in the markets, asset prices may no longer reflect fundamentals, but instead reflect the next perceived intervention by policy makers. In practice, this has meant that many investments have been highly correlated in recent years. Differently said: if everything has gone up in your portfolio of late, you have a problem. How do you prepare for an exit? All successful investment strategies I have encountered have in common that they are based on a plan. A plan that takes into account where one comes from, where one is planning to go; how one intends to get there, with appropriate checks along the way. If this sounds obvious, you would be surprised how few are adhering to these basic principles. And why would I mention these basic principles in the context of a Fed exit? Two reasons: first, one should not lose sight of basic investment principles in addressing any one situation; and second, the best of plans are impacted when others are not living up to their part of the bargain. What I’m referring to is that the Fed – which arguably has a profound impact on asset prices – does not appear to follow those basic principles in conducting monetary policy. The only thing we really know about the Fed’s so-called exit is that Janet Yellen would like to keep monetary policy accommodative to help the convicted felons get a job (as discussed in her first policy public speech since becoming Fed Chair). This characterization may sound unfair, but it’s the simplistic conclusion I have to draw when given her focus on employment, her expressed desire to help ‘Main Street,’ the fact she has never pushed back when being labeled a dove, and her rejection of a rules-based framework to monetary policy. Where we came from: This did not start in 2007 or 2008, but has long been in the making. For in-depth analysis over the past 10 years, please read up on our Merk Insights. For purposes of today, we shall note that investors were burned in 2000, as well as in 2008; wages for many have stagnated. We have endured years of low interest rates, making it difficult if not impossible for many pensioners to live off the income generated by their fixed income investments. Many investors have moved to embrace a riskier mix of investments than they are comfortable with, but stick with their allocations as long as they don’t get burned. To us, this increases the odds of a crash, as those investors may not stick around when the going gets rough. However, we know a few things about this journey: geopolitical tensions have been rising. In ‘Instability the New Normal’, we argue that this is a symptom of the times as policy makers blame minorities, the wealthy, and foreigners when they have trouble balancing the books; rarely ever do they blame themselves. Government deficits are not sustainable; yet, there might not be enough wealthy to tax, either. In that environment, central banks may be pressured to keep rates lower for longer; in fact, we recently argued we might see negative real interest rates for years, even as nominal rates may rise. In a best-case scenario, as we have seen in recent years, this may inflate asset prices, but it may be foolish to base one’s long-term outlook on such gains to continue. Instead, financial repression may persist. We live in an environment where both government and consumers are heavily indebted, with foreigners owning much of the debt, creating the perverse incentive to debase the value of the debt (through inflation or a weaker currency) to have foreigners that don’t vote hold the bag. As someone with savings, don’t trust your government to take care of you. This applies whether you are based in the U.S. or many other countries. You are on your own. How to get there, with appropriate checks: If you just avoid the five mistakes listed above you are already in much better shape than most to achieve your goals. Checking one’s progress applies during good as well as during bad times. When times are rough, remembering one’s priorities (to cut back on unnecessary expenses, continue putting money aside for key goals) is important. When times are good, it’s important to take chips off the table, to rebalance one’s portfolio. At times, I see investors be reasonably diligent about choosing an investment, but then fall into the trap of justifying one’s investment at any cost. A good cross-check of whether to keep an investment is whether the conditions that lead one to invest in the first place persist. Meaning, if one buys company ABC because of good management, then reflect on whether management is still good. If one buys it because of great earnings momentum, well, are earnings still growing? If one buys it because it was cheaper than its peers based on some metric, then, you guessed it, does that still apply? As you might imagine, buying a stock – or ETF - because some pundit recommended it on TV is a bad idea, as you are unlikely to be around when he or she changes his or her mind. A great way to check one’s portfolio is to have it stress-tested against different scenarios. A great temptation in today’s social media driven world is to only listen / like / follow folks one agrees with. But to make a market, we need disagreement amongst voluntary participants. A key reason we publish so much is to engage the public in an effort to receive feedback, so that we can consider viewpoints we might have ignored. An extreme example of that was in the summer of 2012 when we published the Merk Insight ‘Draghi’s Genius’; we did not change our mind upon receiving an avalanche of disapproval, but it kept us on our toes. Similarly, we encourage anyone to look beyond their circle of friends to get out of their comfort zone when it comes to testing investment ideas. •	Cash is an asset class. Investors don’t like to pay their advisers for holding cash. There are clear downsides, as I would even go as far as arguing that cash isn’t even risk free given that your purchasing power is at risk. Still, cash that should come with minimal interest rate and credit risk plays a role (I say “should” as not all ‘cash’ is created equal). If you manage your own money, don’t be afraid of cash; if you have someone manage money on your behalf, don’t hold it against them if they stay on the sidelines – they might be protecting you from potential losses elsewhere. •	If you are looking for diversification in today’s environment, consider alternative investments. At a recent conference on alternative investments, a large wealth manager argued – and I would agree – that 20% of alternative investments in a portfolio are advisable if one wants it to have a real impact on performance. If I look at the portfolio allocation of Harvard’s Management Company in 2013, they only had a U.S. equity allocation of 11%, but when it comes to alternatives, aside from a 16% allocation to private equity, they held a 15% allocation to absolute return; a 2% allocation to commodities; a 13% allocation to natural resources; importantly, they did not feel the need to chase yield, with a high yield allocation of only 2%. This isn’t investment advice and we are not suggesting everyone should replicate Harvard’s allocation, but this should give food for thought. •	Stocks might crash. Having just mentioned an asset allocated with an infinite investment horizon, it may be counter-intuitive to now caution about what may happen in the near to medium term. I can tell you that I’m personally concerned about a crash and am taking precautions. To the extent investors are exposed to stocks, I would encourage them to consider a strategy that employs some sort of hedging or protection; if, indeed, the markets continue to soar, this allows one to participate in some of the upward move. An alternative, of course, is to simply reduce the market exposure and leave the remainder un-hedged. It’s just that if you were to ask me for my favorite investment idea today, it is to get ready for a severe correction in the market; as such, at the very least, I like to have cautioned investors. •	Bonds might be one of the worst investments over the next 10 years. But aren’t bonds supposed to rise due to so-called safe haven demand? They just might, and year-to-date bonds have done rather well. But the math doesn’t add up. If I look out 10 years, I don’t see how we can finance our deficits. Something has to change. I’ll leave it for others to find value in bonds. Personally, I don’t want to touch them with a 10-foot pole. •	The action may be in the currency markets. If I’m wrong on bonds it’s likely because central banks succeed in keeping rates low. But if they keep rates at artificially low levels, two things will happen: first, bonds won’t compensate investors for the risks they take. And second, there ought to be a valve, as the market can’t be fooled in the long-run. That valve may well be the currency markets. If bonds plunge central banks could step in to contain their decline, the currency may act as a valve. If you think this is only a problem for Japan, think again, as the U.S. is vulnerable to similar pressures. This is the key reason why we have made the currency markets our home turf, so that we may be able to stay a step ahead of policy makers as currency wars evolve. •	Gold as insurance? We may think the currency market is where the action is, but while investors have a (all too often misguided) view about the euro and the yen, it’s difficult to get investors excited about the Swedish krona. Frankly, we also like to keep it simple. And the simplest insurance against the mania of policy makers may well be gold. That doesn’t mean gold will always go up; it doesn’t even mean gold will go up more than, say, silver. But gold is influenced by fewer dynamics than other commodities because of its comparatively low industrial use. The fact that it’s ‘just a brick’ is a feature rather than a bug: because it’s not the gold that’s changing, it’s the value of the dollar or currencies. For more details as to why I own gold, please download “Why I Own Gold”. We have a webinar coming up discussing in more detail and more specifically what investors can do to prepare themselves for a potential Fed exit from the ultra-low interest rate environment. Please register to be notified of our upcoming webinars.